I loaded up the truck and displayed several Christmas decorations that were inexpensive and simple to make or pull together. 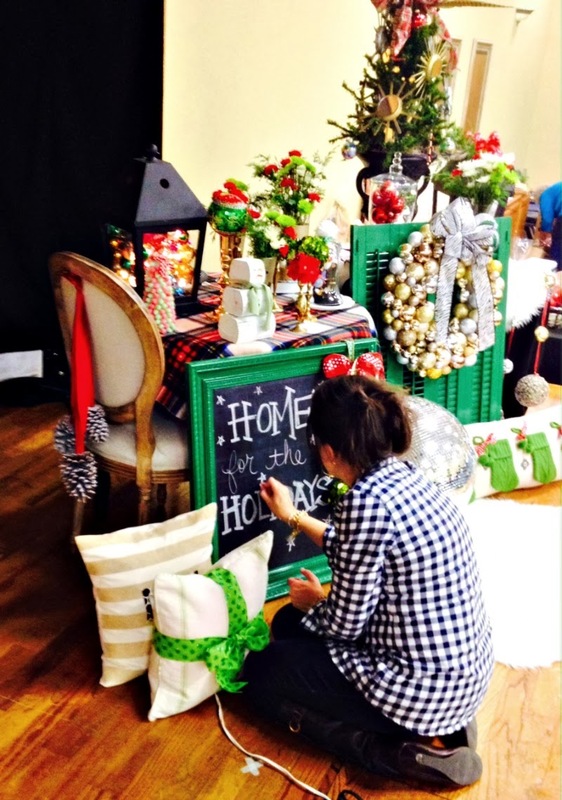 Over the coming days I'll share several of those ideas with you here, and most of them will work their way into my Christmas decor. I wish I would have taken a photo of my set-up, but all I have is this pic my husband snapped with his phone while we were setting up. Now, I'm not rushing past Thanksgiving, but I wanted to go ahead and share these ideas with you so you would have time to make them over the next week or two if you would like to. I never decorate before Thanksgiving, but I think I might this year since it is so late in the month, and we're not hosting this year. Lanterns are such a classic accessory to own. I use mine year round. I shared two ideas to dress them up for Christmas. First, nothing more than a candle and sprig of fresh greenery suggests the season at hand. I also added a fun ribbon and filled the bottom with berries that I cut off of floral picks from Hobby Lobby. 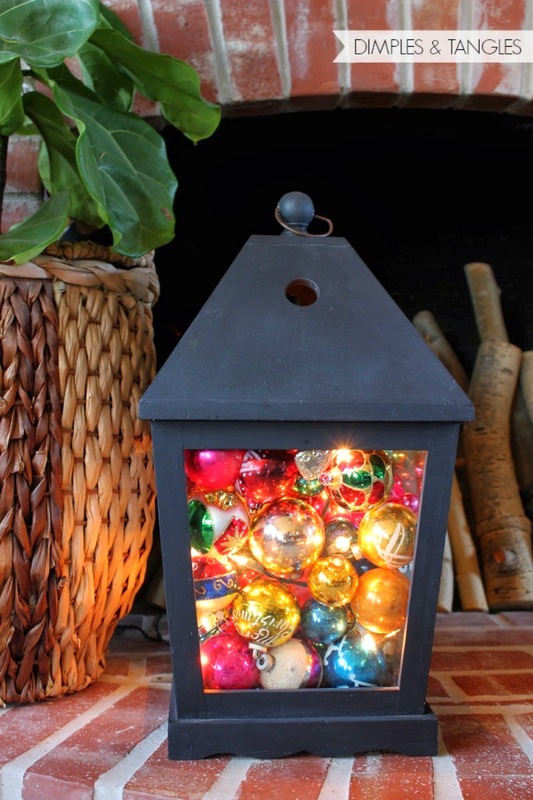 An extra tip here...if you fill the bottom with something that will fall out (shells, acorns, ornaments, etc.) tip the lantern back just a little when you're opening the door to light the candle. Everything will stay in place and if you're gentle the candle won't fall over. For another look, I piled the lantern full of ornaments, and spread a 20 light string of white lights through them as I filled them in. There was enough space where the door opens to squeeze the cord through, and I'll just turn that side towards the back so it won't show. Can you imagine how pretty it would be with all silver ornaments? Or red? Or gold? Next, I took a few wreath ideas to show. 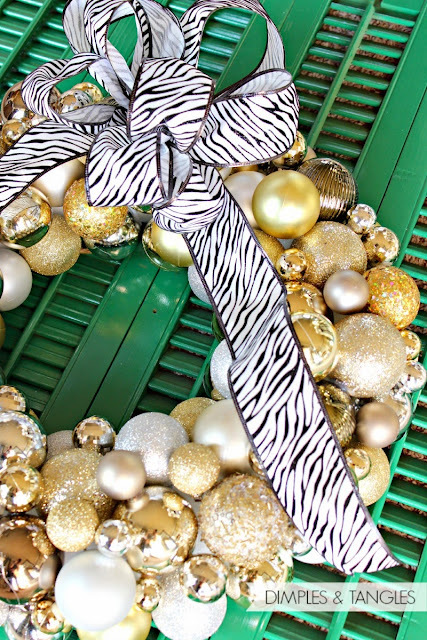 I made this gorgeous ornament wreath by following Kristin's instructions at Bliss at Home. She made it so easy! I've made this type of wreath before on a wire coat hanger and it did not hold up well. This method was fantastic! 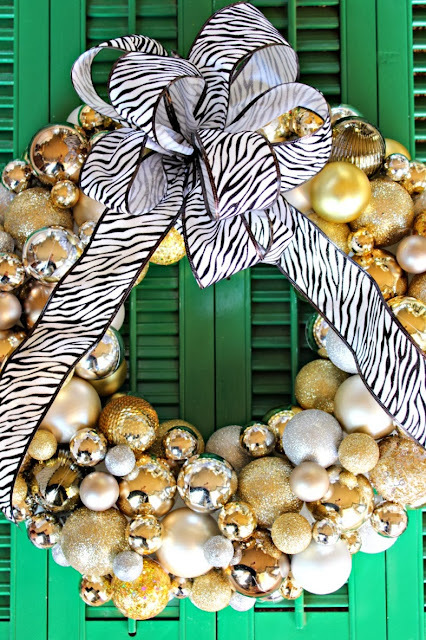 Now, just so you're prepared, even though it's DIY and I bought the ornaments on sale and used a coupon for the wreath, this wreath will still cost around $30-$35 to make. There are a LOT of ornaments on there, and styrofoam is expensive! If you're not in a hurry ornaments should be on your thrift store or garage sale list, and the cost would go down significantly, or pick up a bunch after Christmas to make one for next year! Another wreath I shared was an upgrade. I bought this on clearance at Target last year, but it had silver jingle bells spread throughout it and I didn't like how those looked. So, I tore those off and made some yarn pom poms to fill those spots. I like the texture and fluff they added. Don't be afraid to change up a store-bought item so that you like it better! The last idea I'll share with you today is to glam up some clear vases or containers. I found some glass containers with straight sides that I liked the shape of from the thrift store. I don't think I paid more than $1 for any of them. Then, I grabbed some star stickers from the dollar store, some left over garage sale price stickers, and some painter's tape. I used the stickers and tape to create the patterns I wanted on the vases, making sure that the edges were adhered well. I also covered the bases of the pieces that I did not want painted with a small plastic bag. Now, time for the sparkle! I sprayed two light coats of regular gold spray paint on the outside of each vase, then I tried out the new Gold Glitter spray paint from Rustoleum on top. With the regular gold underneath, the coverage was great and I only needed a little bit of the glitter paint. Want to see what your house would look like if you've been crafting for days? Well, yours might not, but mine did. Ugh, projects strung out everywhere! I'm off to finish cleaning up. Tomorrow I'll share another Dollar Store project with you. I think it's my favorite of all! Love it all Jennifer!! That sparkly gold paint is awesome!! All great ideas, Jennifer! I love the way you dressed up the lanterns. I had to do a double take on the project with the glass and stickers. What a great idea! What a fun presentation, I bet the ladies loved it!! Mess = progress!! :) I love the ornament wreath in my favorite color! I'm so thankful that you show the other side of DIY projects. 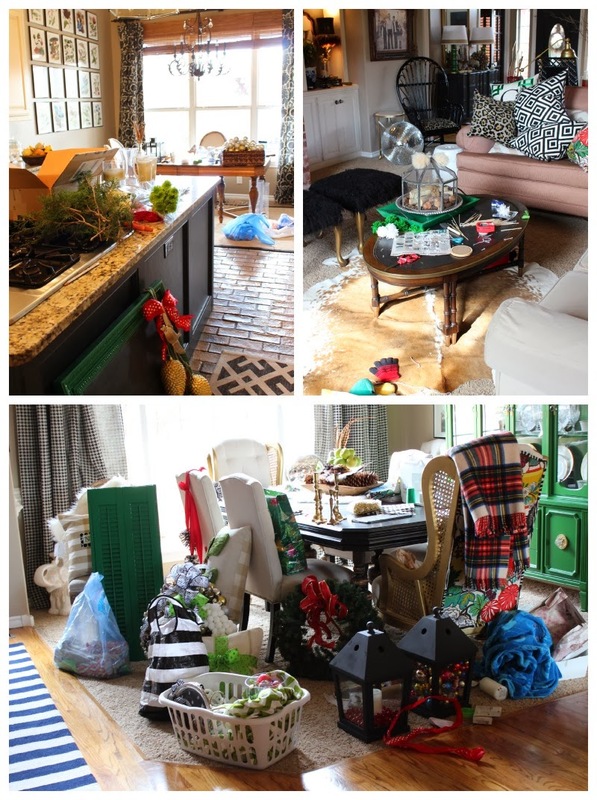 As a reader it makes me feel soooo much better about the aftermath in my own home and the progress as well as hard work it takes to have the beautiful "after photo". 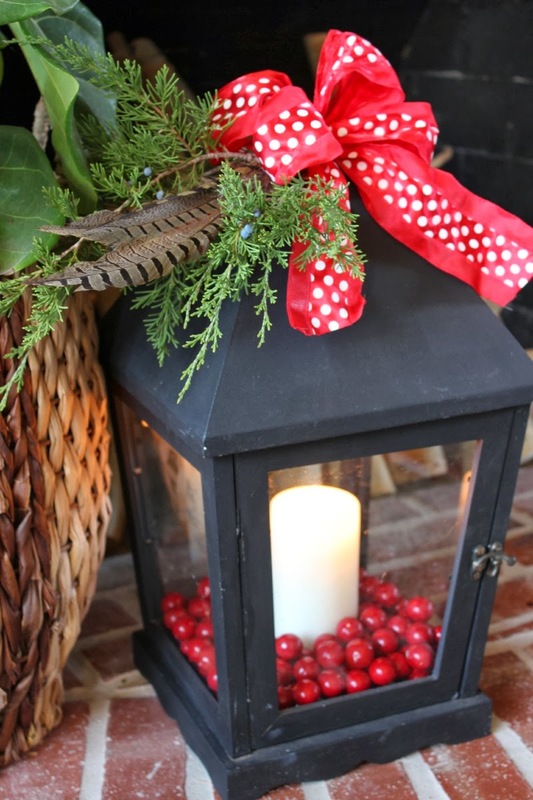 I am totally copying that lantern idea! Loved having you at CCC Saturday night! All your ideas were wonderful and so doable! Thank you for sharing and I love your blog! I am hoping to do crafts with my grandchildren as gifts for their parents. 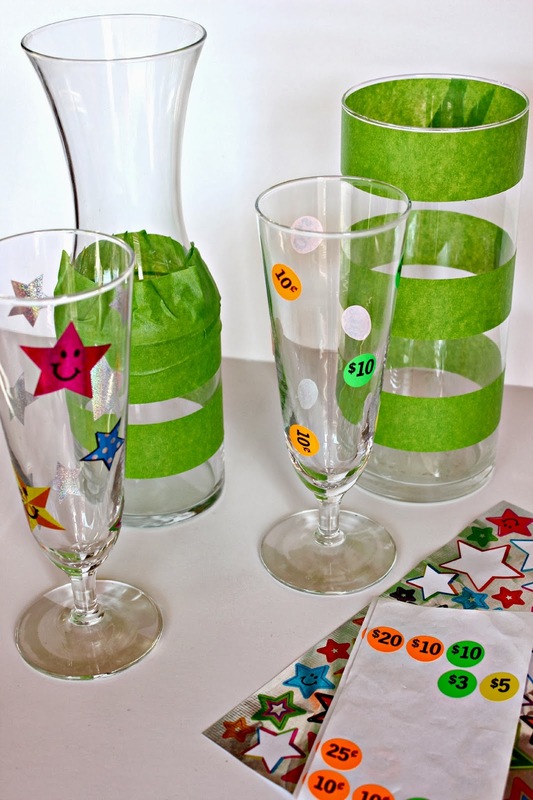 These are fabulous inexpensive gifts the kids will enjoy adding their ideas and handiwork. Thank you and keep them coming! Love everything! 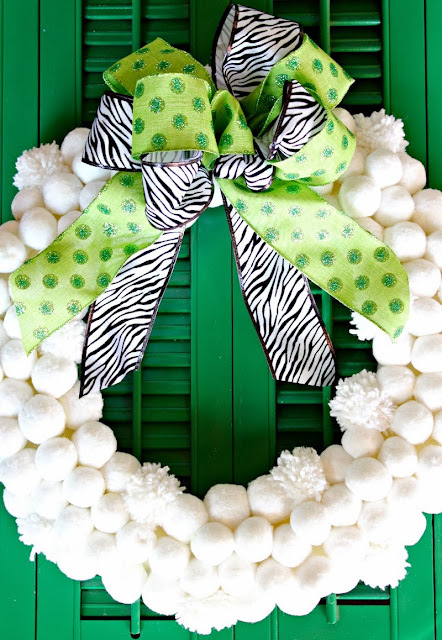 The little pom poms you added to the Target wreath were a great idea - agree that the added texture really makes it. SO fun! love the lantern filled with ornaments! Such fabulous ideas! 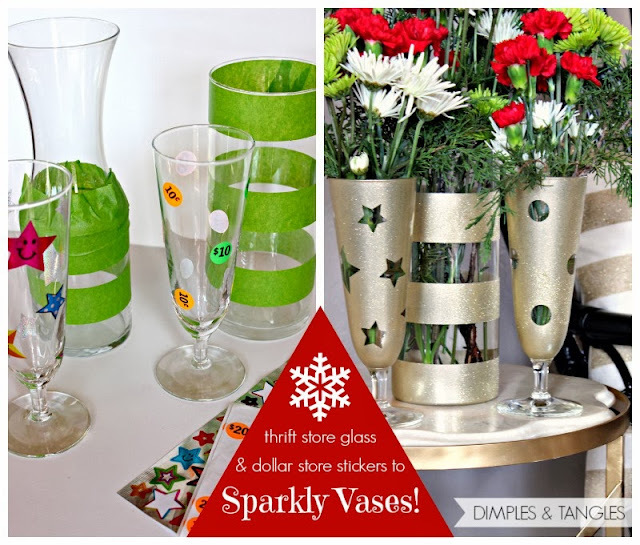 I love how your vases turned out and need to add that glitter spray paint to my holiday craft list!! 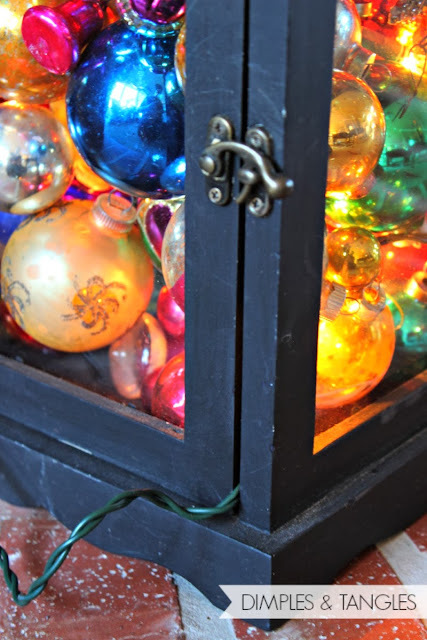 And love the lights inside the lantern…..the affect is gorgeous! Wonderful ideas!!!! Thanks for sharing early before the rush of the holidays sets in! great ideas! and I must say that i was laughing so hard at your home shots! That is EXACTLY what my house becomes when I've got myself into a project! 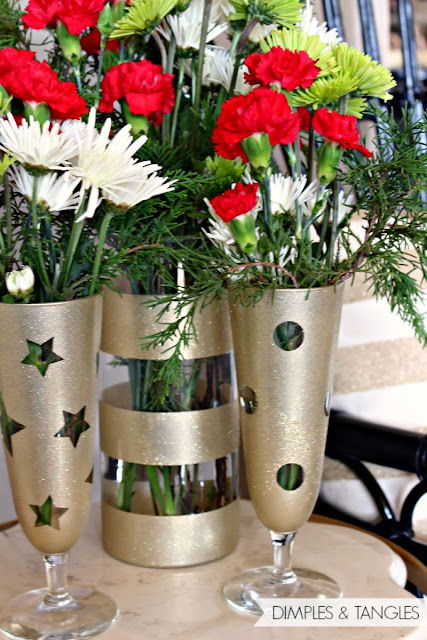 The vases are an adorable idea and the wreaths are gorgeous. Thanks for sharing and to Kristin from Bliss at Home as well. THANK YOU THANK YOU for posting the "real life" of crafting. I made a "little" pinterest craft with my kids yesterday that took HOURS and LOTS of mess. I think "amateur time estimate" and "potential collateral house damage" should be required for any pins. SO excited to try the vases for our homemade gift exchange! !